Why are millennials investing less and trading more? To make long-term investments, an investor must be patient. As these investments take their time to bear fruits, it does not go so well with the millennials who like quick results. Across generations, there has been a visible change in the style of investments. 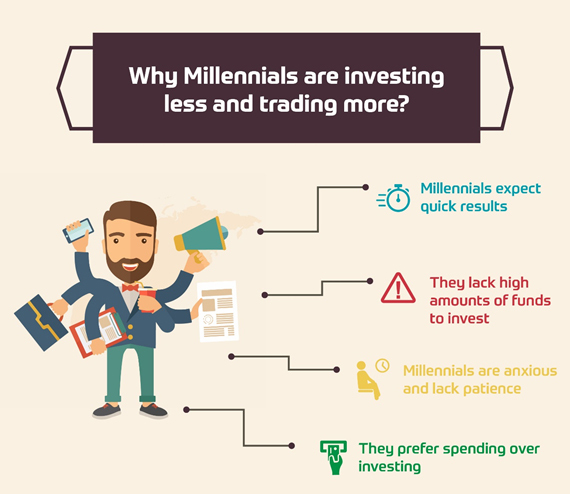 While the previous generation (Gen X) believed more in investing over trading in the stock market, the Gen Y, popularly known as the millennials, prefer investing less and trading more. Before we get into the reasons for millennials’ financial preferences, let us first understand who millennials are and what the common mindset of this generation is. Millennials are people who attained their adulthood in the 21st century i.e. individuals who were born in 1982 and onwards form the millennial generation. Millennials are often termed to have a much different approach to situations than their previous generation. They are always on the go, restless, and have very high expectations. Amit asked his son Ajay, who is in his early 20s, why his generation of millennials are investing less and trading more, completely in contrast with the previous generation. Millennials expect quick results: Right from having instant two-minute noodles to every other thing, millennials thrive for quick results. Millennials feel they don’t have enough time given their over-flowing bucket lists. It is this approach that keeps them on the go after something or the other. Similar is the case with investments, where they expect quick results; this is possible in trading and not through long-term investments, making the former preferable. They have high ambitions: This generation doesn’t want to settle for less, they want everything king-size, which sometimes makes them overambitious. It is this ambition which makes them go for trading, as they feel it can help them accumulate wealth in a short span of time. Millennials are anxious and lack patience: To make long-term investments, an investor must be patient. As these investments take their time to bear fruits, it does not go so well with the millennials, who like quick results. They lack high amounts of funds to invest: Millennials feel they require high amounts of funds to invest, which they lack. Given the lack of due salary appreciation and the high costs of living, they are not left with higher amounts in their bank accounts. This makes them choose trading over investing as they feel trading can be done with lesser amount unlike investing. Millennials have a higher risk appetite: This generation does not shy away from taking risks for that big leap, unlike the previous generation. This makes them comfortable with the idea of trading despite the higher risk involved in it. They are tech-savvy: Millennials are quite tech-savvy and use apps for almost everything in their lives. With so many apps available to assist them with online trading, they go for it, rather doing the manual analysis for investments. Millennials prefer spending over investing: This is a generation of spendthrifts who believe in the quote “You only live once”. They like to splurge money on a lavish lifestyle, from branded clothes to latest gadgets. Unlike the previous generation, which was frugal one, this generation prefers spending instead of saving or investing for the future. It is this basic difference of perception and opinions which makes Ajay trade more and invest less, unlike what his father Amit did in his times.